Falcon Extremetube™ is a new liner made from PEEK Polymer. This unique thermoplastic is the strongest high tensile (14,500 psi) and high temperature (500° F / 260° C) liner material available with nearly 30 years of application experience in demanding oil and gas environments. Extremetube™ is an excellent alternative to corrosion resistant alloy (CRA) tubulars when performance, cost, and delivery time are important. 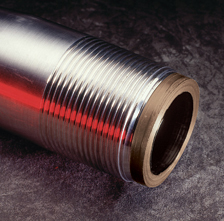 Extremetube™ is a unique new solution now available for the most severe downhole corrosion and wear problems. This polymer offers the greatest resistance to acid gas permeation of all Western Falcon liners. Some uses or applications of this product may be covered by one or more patents.